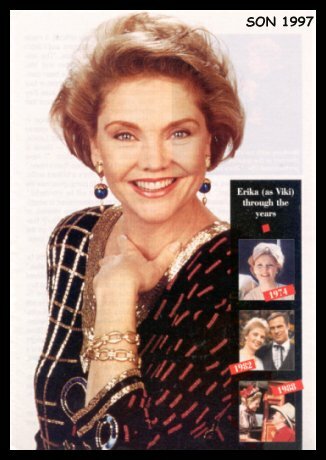 Erika Slezak first set foot on the set of One Life to Live 26 years ago this week -- and walked into the pages of daytime history. On March 17, 1971, she became the third actress to portray poor little rich girl Victoria "Viki" Lord, and after a quarter century of playing Viki (or, more accurately, Victoria Lord Riley Burke Riley Buchanan Carpenter), she is the most Emmy-winning performer in daytime history (five wins for Outstanding Lead Actress)! "When I went into this' business, I thought I was going to become a stage actress, and that's where I started," Slezak says. "I did repertory theater and I was really working my way slowly, methodically, towards Broadway. But when I got to Broadway, there was this big door that said, 'television,' and I picked the television door," she laughs. As Slezak notes, television then was much different from television now. "It's much more sophisticated today. They're not afraid to tackle very difficult problems. The writing is much more sophisticated. So are all the camera techniques, the lighting, costumes, sets, everything, because, although we are not competing, with nighttime, we are compared to it in a sense by the viewers." Much else has changed over the past 26 years on OLTL. For example, Viki's multiple personalities. For most of the first 25,there was only one -- flirty Niki Smith. But during the past couple of years, the writers gave Viki five separate personalities and gave Slezak a chance to really show her stuff as an actress. "The challenge of the multiple personalities and what that gave me was just brilliant," she says. "I fell in love with those characters." Slezak has also enjoyed OLTL's rather outrageous fantasy storylines, including the famous "Heaven" plot where Viki went to the hereafter and was reunited with dearly departed friends and family. She particularly loved OLTL's "Old West" storyline, in which she played the dual roles of Viki and Miss Ginny. "I've had two fantasies," she admits. "I wanted to be in a western, wear the long dresses and ride in the stagecoach, and my other fantasy was to do a Civil War, belle-of-the-ball costume drama, where I would wear these wonderful clothes and dance with some wonderful fella." Along with the fun storylines, there have also been some very difficult ones, ranging from the death of Viki's long-lost daughter, Megan, to the divorces from and deaths of, her various husbands. And while Slezak's dramatic ability is first rate, it hasn't always been easy to play some of the more outlandish storylines. "This last story, where Viki tried to kill her son Kevin, was very difficult. It made no sense to me at any point, and I didn't like playing it," Slezak notes. "The relationship between Dr. Durbin and Viki, which was supposed to have been completely fleshed out in the first three or four months, was non-existent, because they never wrote anything for us. I found that very disappointing." However, with the recent change in OLTL's head writers, soap veteran Claire Labine and her son, Matt Labine, have recently come aboard Slezak is enthusiastic about the future. "I have been a fan of Claire's since Ryan's Hope," the actress says. "She's a brilliant writer. I know she's going to pump great new life into this show and it will be wonderful." What's yet to be determined is whether Viki will have a new love interest, or perhaps even reunite with her fourth husband, Clint Buchanan. Reflecting on the actors who have played her past loves, though, Slezak has no complaints. "It's hard to say which one was my favorite, especially since they're all alive," she laughs. "Bernie Grant. who played Steve Burke many years ago, was so funny and charming. Lee Patterson (Joe Riley) is funny and wonderful, and we're still good friends. Clint Ritchie (Clint Buchanan) and I have had a wonderful relationship all these years. Roy Thinnes (Sloan Carpenter} is a wonderful actor, a delight to work with every step of the way. He is a gentleman and a charming, intelligent, sophisticated man. I miss him." Is there no great love of Slezak's professional life? Sure there is: It's Robin Strasser (who plays Dorian, Viki's archenemy and ex-stepmother)! "You couldn't ask for a better partner than she is, because as characters, we are so opposite and, yet, we're so alike," says Slezak. "Robin is one of the most intelligent people I've ever met. She is so sharp, so remarkably talented. It's a joy for me to come in, look at my script and say, 'Oh, I get to work with Robin today!' She's just fabulous!" In her personal life, Slezak's loves have been much fewer than Viki's most notably, her father, famous actor Walter Slezak; her husband of 19 years, actor Brian Davies; and her two children, Michael, 17, and Amanda, 16. Slezak credits her husband with keeping her priorities straight -- that family comes first. That level-headedness may be one reason she's stayed on OLTL for 26 years -- and never gained the reputation of being a daytime diva. "As fabulous as it is, this job could end tomorrow." she points out. "The biggest pitfall in this business is when you believe your own publicity. I've never given up the idea that I'm simply a working actress, and that everything else that has happened to me has been lovely and gravy, but it's just that -- gravy. You cant let your head get terribly enlarged." Well, actually you can. "This is a very cruel and unforgiving business," says Slezak. “Frequently, people go off to Hollywood because they say they are too good for soaps. I go, 'No. No.' Nobody is too good for soaps. Don't ever leave with that kind of attitude. To say that you're too good for soaps is stupid and invariably comes back to haunt you." Which isn't to say that pursuing other professional activities is something that Slezak looks down on. "There are people who leave because they just want a break and then they come back because they know it's fun:" she says. "I know the value of what I do here. I may go off and do something else, but I will come home." Last year, for example, Slezak did her first TV movie, Full Circle, an experience she thoroughly enjoyed. "Sure, I'd like to do more of them, but again it's a question of managing family," she says. "I don't really like going away for weeks on end, living in a hotel room and being away from my husband and kids. You know, you have kids for a reason and you love them and want to be with them, because they're going to be gone soon enough anyway." But Slezak has no regrets -- not about putting her family first, and certainly not about staying with OLTL for 26 years: "It's been great fun along the way. Otherwise, I would not still be here."